It’s always a great temptation to turn any tropical destination into a vacation factory. A place where thousands seeking a warm respite from the cold and the workaday world are processed in, soaked in alcohol, baked on the beach, and processed out. There are some who come to play with the interesting toys, sailboats for instance. Thus the popularity of chartering, but while most tourist who visit Europe do so to experience the culture, few come to the Caribbean for such a reason. If a place can provide a number of islands spaced conveniently close to each other in reasonably protected water. Water that features the requisite color and clarity. It can charge good money to let people rent boats and have a week or two sailing in paradise. A place like the Virgin Islands, both British and American. These places do have cultures but it’s not what most tourists come for. I should not be harsh. There is nothing wrong with providing a recreational activity and charging a fair amount for it. Linda and I have both chartered and led scuba diving vacations in the Virgin Islands and have always had a particular fondness for the British Virgin Islands, so it was with great anticipation that two weeks before Christmas we set out from Antigua for a day and a half passage to the BVI. The dawn of the second morning at sea saw us closing in on Norman’s Island. The plan was to anchor at Norman’s Bight for the rest of the day, which was a Sunday, and early on Monday morning make the short trip to Roadtown, Tortola to clear into customs. When we entered the bight it was no surprise to us that it was crowded. We knew that it was a popular place with the charterers so we shouldn’t have been surprised when we found everything organized to cater to them. On an otherwise uninhabited island there was a beach bar promising a raucous good time to any one wanting to participate. Also the place was filled with moorings and, since the few spots available for anchoring were pretty much already taken, we were compelled to take one at twenty dollars a night. Well, I’ve been known to have a raucous good time at a beach bar and years ago when we were charterers ourselves we’d probably find Norman’s Bight to be a fun place. But something has happened to us over the last year. We’ve become cruisers. I feel that no one who is full-time cruising should describe his or her venture as a vacation and I can probably safely say that most all our cruising friends feel the same way. Typically a vacation is spent as an escape from everyday life and if you overindulge a bit, well, it’s only for a short time and discipline can be reestablished when it’s over. If a cruiser thought of cruising as a vacation it could lead to full-time overindulgence and ruination. Also it has to be said that there is a certain amount of hard work associated with cruising. Not as much as working for a living but there’s always work to be done on the boat and securing life’s necessities is generally more laborious and time consuming. (We’ve literally spent the better part of a day just retrieving our mail.) In addition there are times that are anything but blissful and are characterized by experiences not normally associated with vacations. So, as we sat in the cockpit of Bellatrix on a mooring in Norman’s Bight (did I mention that the moorings were twenty dollars a night), surrounded by charter yachts filled with partying vacationers, we found ourselves out of sync. We were on a different wavelength and the loud music emanating from the other boats and the bar did not amuse us. For sure we’ve had to endure loud beach bars down island but we’ve always found peace by keeping our distance from the bars and staying in the company of other cruisers. Here there was no escape. Our lives could be characterized by the last stanza of the alternative lyrics to Auld Lang Syne. We’ll celebrate at half past eight and be in bed by nine. No one else around us seemed to subscribe to that philosophy. I must divert a bit and take a moment to offer some of my thoughts about bareboat charterers. While many old salts regard all bareboaters as incompetent and a menace to navigation I contend that ninety percent of them are capable sailors. Since many are only weekend sailors in unfamiliar boats there is a certain amount of awkwardness but this is not because they are incapable. However, if ninety percent are okay that leaves a ten percent Bozo factor and in a crowded BVI anchorage ten percent is a lot of Bozos, enough to tarnish the reputation of all bareboaters. I remember watching a bareboater completely botch an attempt to anchor his rented yacht in Little Harbor on Peter Island. He managed to hook another yacht’s anchor chain and while trying to disengage from it ended up colliding with the other yacht. All eyes in the anchorage were on the Bozo. He had our undivided attention. Meanwhile, during all this, several other bareboaters moved into the anchorage and successfully secured their yachts with little notice. Those of us who are fortunate to live full time aboard our yachts and become completely familiar with boat handling should give credit where it is due and not be overly critical. Anyhow, we were out of sync and the feeling persisted most everywhere we went. I can remember being highly annoyed at a crewed charter yacht when they took their guests water-skiing with their powerful dinghy. Nothing wrong with water-skiing but they insisted on weaving in and out amongst the moored yachts. Since there were swimmers and snorkelers in the water it was dangerous as well as annoying. I’m perhaps painting too gloomy of a picture. 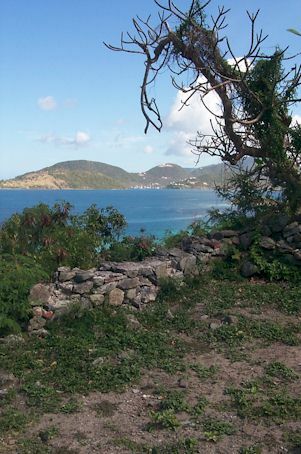 The BVI is a truly wonderful place but we just could not tune in to it. When we arrived in Gorda Sound the place was as beautiful as we remembered but a quick look around revealed that it was now over developed. Indeed it was environmentally sensitive, low impact development but everywhere there could be a bar, restaurant, or hotel there was one. It was not a place to spend a quite night at anchor (or twenty dollar mooring). Well, there were people all around us having the time of their lives. It was us. We were out of sync and it was our problem to solve. The next day we sailed to Sopers Hole at the west end of Tortola and the following morning, which was Christmas Eve, we cleared out of BVI customs and proceeded to Maho Bay on St. John, U. S. Virgin Islands. 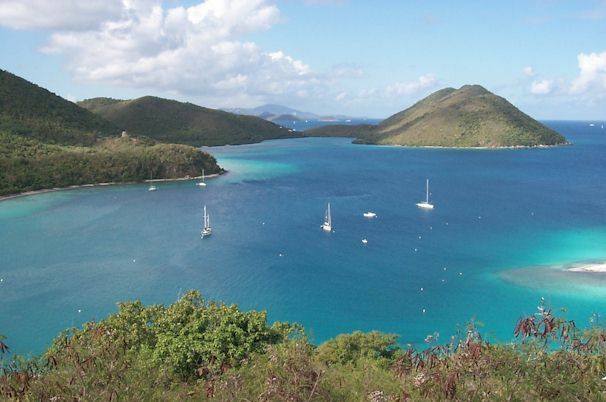 In our opinion St. John is the best among all the Virgin Islands, Both British and American. This is primarily due to the generosity of Laurance Rockefeller. In the early 1950’s he purchased large tracts of land on St. John and donated it to the U. S. Government for use as a National Park. This has made some of the nicest beaches and anchorages off-limits to commercial development. 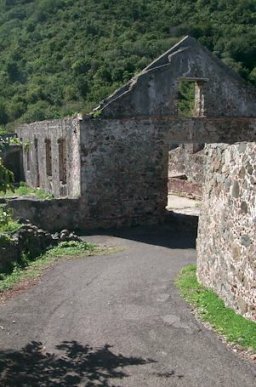 In addition the U. S. Park Service maintains historical and cultural exhibits such as the ruins of the Annaberg Sugar Mill along with numerous hiking trails. 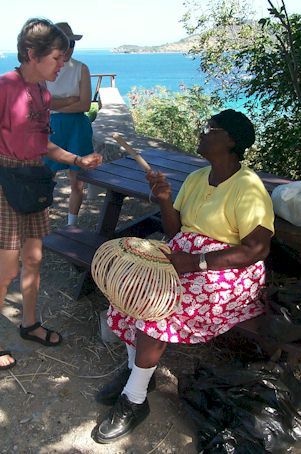 The Park Service has done a good job making the park into a place where one can have a true Caribbean escape. 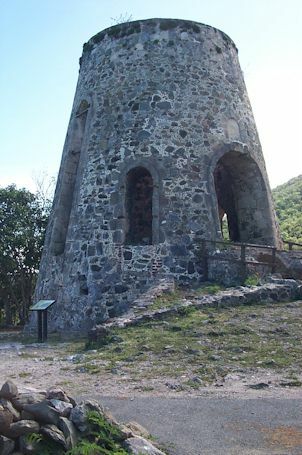 It was commercialism that we were trying to escape and it was with great hope that we sailed through the cut between Mary’s Point and Whistling Cay into Francis Bay. Both in Francis Bay and in Maho Bay to the south there were quite a few yachts so by no stretch of the imagination could we call this place secluded. But we took a closer look. Many, indeed most, of the yachts sported wind generators and solar panels and the decks were lined with jerry jugs. Cruisers! We’re home. As we picked up the mooring Laurie and Bob from Pride came by in their dinghy, introduced themselves, and told us that there was to be a special Christmas Eve gathering of cruisers to occur just before sundown. It sounded like fun so we told them to expect us there. At the appointed time, about an hour before sunset, we got into our dinghy and headed to the festivities. I’ve previously heard of such a thing but have never before witnessed or, much less, participated in one. What happened is that all the cruisers brought their dinghies to the windward side of Francis Bay and tied them together into one amoeba-like gray blob of little rubber boats. Of course we immediately started drifting to leeward and there were times when the blob threatened to collide with a moored yacht. On such occasions the dinghy that was on the most advantageous side would start its outboard and push the whole mass out of the way. It’s called a dinghy raft and everyone brought food to share. Someone brought a trumpet and another brought a keyboard and soon we were having sing-along Christmas Carols. In a place without shore facilities it was an ideal way to establish a quick party venue and, since we were cruisers, when the sun dipped below the horizon the raft took only seconds to break up. After our hour of friendship and good cheer our big gray amoeba disintegrated unto thirty small rubber dinghies heading home to the individual yachts. It was soon dark and peace and quite descended up on the anchorage. Most were indeed "in bed by nine." We had found our place and were, once again, in sync. And, by the way, the U. S. Park Service moorings were free.